As my excruciating and contentious divorce finally drew to an end, I decided to treat myself to a trip to Tuscany in Italy. 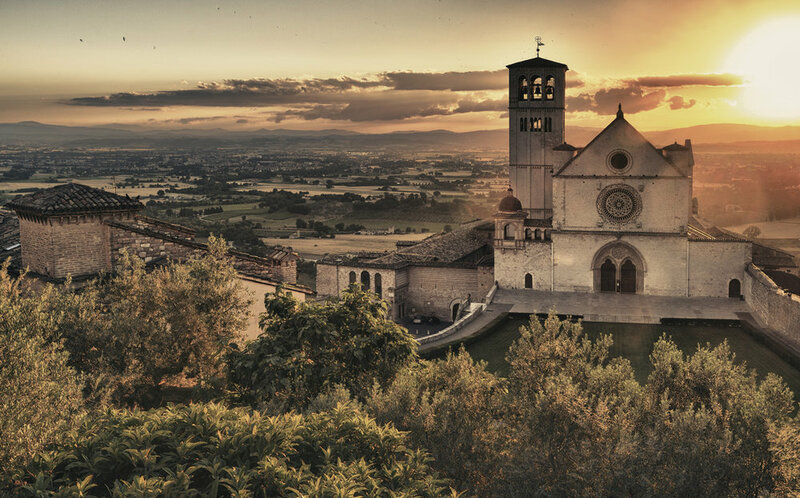 After weeks of steeping in art, architecture, beautiful country sides and delectable food, I found myself in the city of Assisi, the home of the infamous St. Francis. Not having been raised in any formal religion, I knew very little about Francis. Oh, sure, he wrote a beautiful prayer (which I have framed on my wall at home), you know the one, “Lord make me an instrument of thy peace…” And I seem to remember that Francis loved animals, but that was the depth of my knowledge. I found myself sitting in the small chapel he had prayed in, a chapel so famous the Italians had built a grandiose cathedral around it. I was surprised at how “the spirit” moved me. Encircled by the wattle and daub of the bricks that made up the walls of this old and impoverished chapel, and staring at the simplistic altar, that was indeed dwarfed and made to looked pathetic compared to against the ostentatious golden altars that surrounded it outside in the cathedral, I decided to drop within and just pray. As I sat in this humble chapel, I felt an energy enter my body from the top of my head. It moved down my spine and spread throughout my body. It was like an electric system pulsing in every cell … and I thought, this must be what Grace feels like. When I left the simple, plebeian chapel, my senses were accosted by the garish displays of piety and wealth. Certainly they missed the whole point of St. Francis, a simple monk who lived like a hermit in the mountainside of Assisi. Later, as I hiked with my companions up the hill to see the cave Francis had lived and meditated in, I began to feel that peace I had prayed for. Again, having just recently come through a mind blowing and heart shattering divorce that had left me completely uncertain of who I was, my experience of peace up until then was very limited. Uncertain as to whether I could trust myself and this newly found peace, I concentrated on the red, hard packed earth and the smells of the plant life around me, including the tall, whispering olive and oaks trees that grew rooted on the hills. Certainly, these same trees were present all those hundreds of years ago when Francis made his trek to this cave. The trees didn’t look like sentinels as much as gentle witnesses to the human endeavor to touch God. As we approached the cave, I was undone by the amount of people surrounding the place. It was what I had felt in the grand cathedral when I had exited the chapel. Something deeply holy and sacred was here but the people didn’t seem to feel it. My sense of peace was disturbed as I tried to see if these tourists were here for sanctuary or just to tick off another item on their sightseeing list. Finally, it was my turn to enter the cave. Only a few people at a time were allowed in. I have always been fairly short, having reached my full stature of 5’ 3” by age 10, so I was surprised at how tiny the cave was. The walls were rough and chilly compared to the warm air outside. I couldn't even stand up straight. But I could feel something here; some of the same energy of the Grace I had felt in the small chapel. Then I noticed a depression in the wall of the cave, just big enough for someone to sit in. I felt invited to have a seat. Not caring if that was against the rules, I sat my bottom in the depression of the cave. Immediately I felt held by some holy and loving presence. It felt as if gentle arms were enfolding me, and whatever pain I was still carrying came to the surface. Believe me, there was still a lot of pain. Soon the gentle kindness of the loving energy became too much for me as more tourists tried to stuff themselves into the small space. I had to get out. I escaped to the healing presence of the trees outside. I hiked up into the grove of olives and oaks, allowing the pain and grief to pour itself out onto the ground as I sobbed. Indeed, the trees held witness of the power and presence of St. Francis, as the hermit monk forged me into an instrument of peace and love.